Earn up to 13 Paw Points. Nature’s Harvest Adult Original made with ocean fish & brown rice is ideal for dogs with a dietary sensitivity to other meats. No artificial flavours, colours or preservatives are used in this product and we add glucosamine & chondroitin to support correct joint function. Natural rubbed herbs and vitamin C are added for their antioxidant properties as well yeast extract that aids in supporting the immune system. Salmon oil is used to enhance omega 3 and 6 fats for maintenance of healthy skin and coats. Nature’s Harvest Ocean Fish & Brown Rice is a complete food available in single trays of 395g or packs of 10*. Ocean Fish 60.0%, Brown Rice 5%, Vegetables, Peas 2% Carrots 2%, Seaweed, Mixed Herbs, Glucosamine, Chondroitin, Yucca Extract, Cranberry Extract, Yeast Extract. Vitamin A 2,250 IU, Vitamin D3 328 IU, Vitamin E 26 mg.
Zinc sulphate monohydrate 67 mg, Iron sulphate monohydrate 42mg, Copper sulphate pentahydrate 9.6 mg, Manganese sulphate 6.3 mg, Calcium iodate anhydrous 0.71 mg, Sodium selenite 0.09 mg. Protein 10%, Fat content 5.0%, Crude fibres 0.3%, Crude Ash 3.0%, Moisture 75%. Begin with the recommendations provided below and adjust to maintain body weight. Your dog’s needs may differ from the guide below due to age, breed & activity level. Always feed to maintain a lean active condition. Provide your dog with a clean container of fresh water daily. 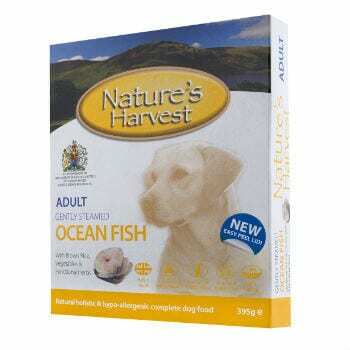 If your dog has not eaten Nature’s Harvest Adult Original Ocean Fish & Brown Rice before, it is best to introduce it slowly over a couple of days. Feed as a complete meal or with Nature’s Harvest Wheat Gluten Free Mixer. Always consult your vet with any health questions. Store in a cool dry place away from direct sunlight. Feed at room temperature. Once opened cover and store tray in the fridge for up to 48 hours. The product can be microwaved for 30-60 seconds before serving, it should then be consumed within 20 minutes (but ensure that it is not too hot). The product may be portioned for use as required and frozen if desired. The portion of the product frozen should be transferred to a separate container or well wrapped in either foil or plastic. Care must be taken to ensure the product is fully defrosted to ambient temperature prior to feeding. If using a microwave to defrost the food, ensure no ‘hot spots’ are present in the food prior to feeding.